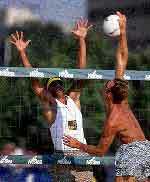 Volleyball is an enjoyable activity for the beach or the park. The game is played by two team of six players, with up to six substitutes allowed in a squad. A net is fixed across the middle of a court eighteen metres long and nine metres wide. Two flexible antennae mark the extremes between which the ball must pass over the net. Play starts by one player serving the ball over the net from behind the base line. When the ball has passed over the net, the receiving team may play the ball three times before they must pass it back over the net. Each player is only allowed to touch the ball once. The object of the game is to force the ball down onto to the floor of the opponents court, or to put them under so much pressure that they are unable to return the ball. In volleyball, if the ball does not go back over the net, the opposition win a point. After each time a team wins the ball back from the opposition each player rotates one position clockwise. This rotation is a special feature of the game and it means that all players must play both in the front line and the back line. A team wins a set by scoring 25 points with a two point lead and wins the match by winning three sets.